Coat an 8-inch square baking pan with pan spray. Meanwhile, beat together the filling ingredients until light and fluffy. Pour the filling over the hot crust and bake an additional 25 minutes or until no imprint remains when lightly touched. Mix together the sour cream and sugar for the glaze. 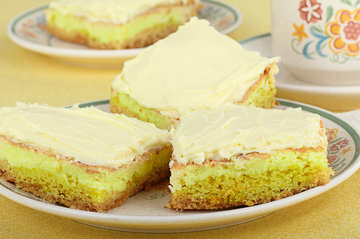 Spread evenly over lemon squares. Return to the oven and bake 5 more minutes. Cool completely and then cut. Per serving: 96 calories; 1g protein; 5g fat; 3g saturated fat; 27mg cholesterol; 81mg sodium; 21mg calcium.